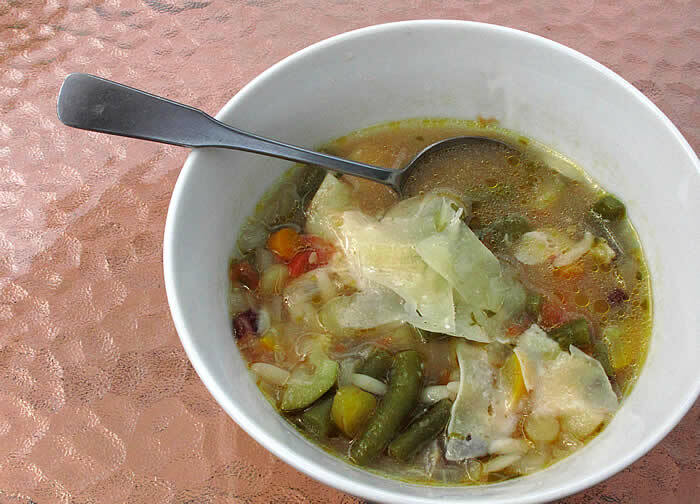 As I continue to move my recipes off my “smart-phone”, so I can cook with my iPad in the kitchen, here is my summer vegetable soup, adapt from the Joy of Cooking. * 2-6 Thin Carrots, Peeled and Chopped. * 2-4 Tomatoes, Skinned, Seed & Chopped. * 4-8 Small Red (or White) Potatoes, Quartered. * 1 Small Zucchini, Slice. * 1 1/2c Green Beans, 1″ Pieces. * Warm oil in Dutch Oven on Stove at medium heat. * Cook till tender, 20+ minutes. * Add in Tomatoes and Potatoes. * Add stock and bring to simmer. * Add in Beans, Zucchini, Orzo and Basil. * Simmer until the pasta is tender. * Remove the soup from the heat. * When serving, add slivers of Parmesan Cheese. * Keeps for 3 days. Oh yes,Orzo is the most under-rated Pasta there is! A christmas tradition that has spanned 2 decades has been making cheesecake for the fests! The requests typically focus on Chocolate or Mocha. 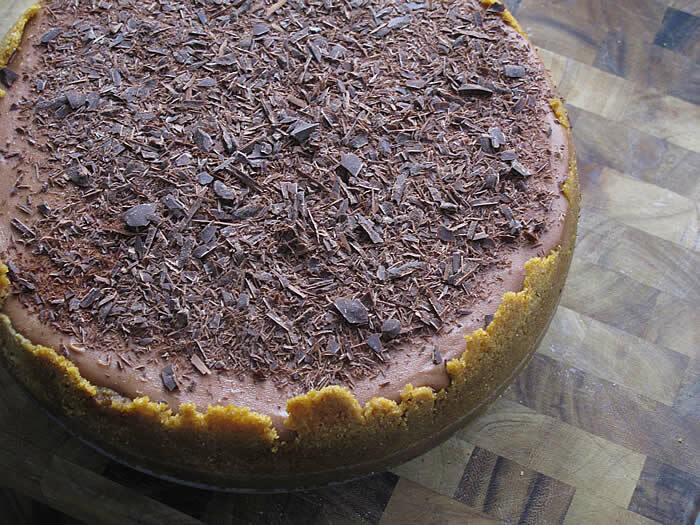 Here is a simple and very good Dark Chocolate Cheesecake, from my cheesecake reference book – The Joy of Cheeesecale from Bovbjerg and Iggers. This book is also a revelation, in that did not just provide recipes, but also a discussion of cooking mechanics and chemistry. In Oven place pan of water. Mix *well* Cream Cheese ad Sugar, until mixture is light. Stir in chocolate and sour cream. Pour in pan with prepared crust – either graham wafers or oreo crumbs. Quickly plcae into the oven. Turn off oven and let it cool in the oven. Next day, add Chocolate shavings the next day. Two of my favourite things about summer is fresh corn and vegetable soups. 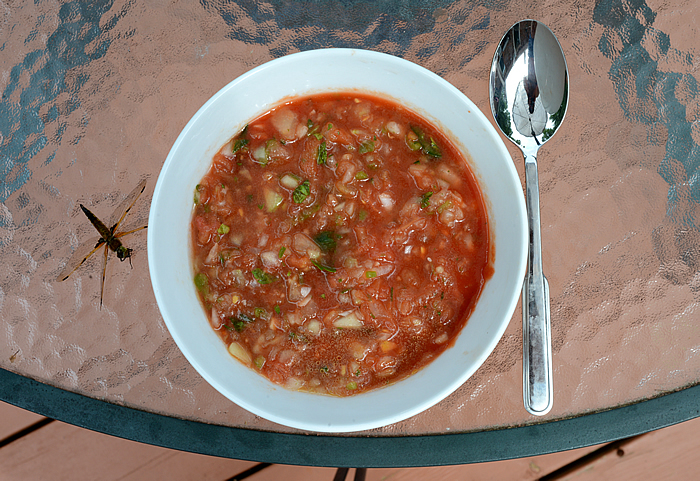 On hot summer days, it is Gazpacho Soup. Finely chop the cucumber, onion, parsley and green pepper. Add to final serving bowl. 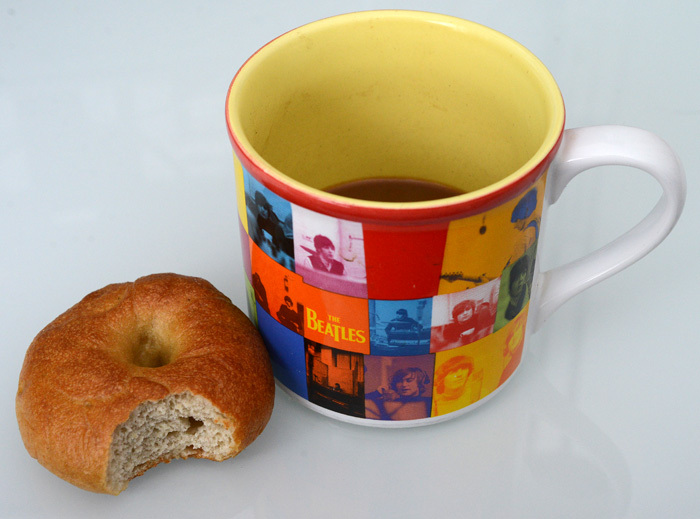 Coffee with this morning’s bolied bagel, by Judy. So Tesla (the daughter) is doing her final year thesis (marketing and advertising) on Fleischmann’s Yeast. 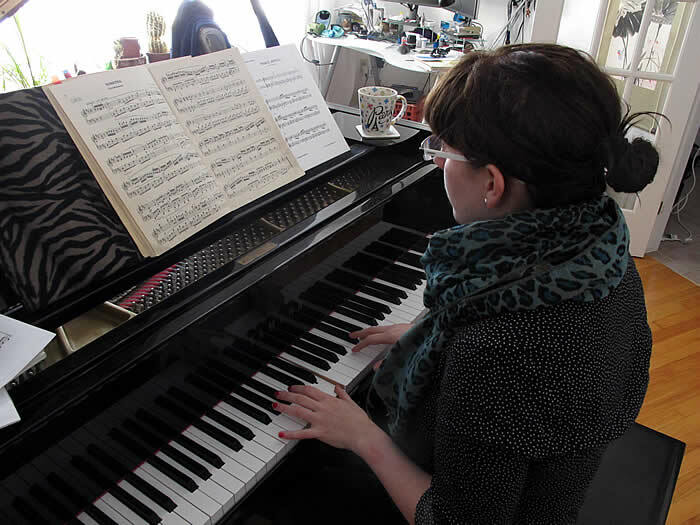 Her research involves baking up a storm and we benefited during the Christmas holidays, as she made us croissants and bagels. The croissants were nice, but the bagels were fabulous (IMHO). 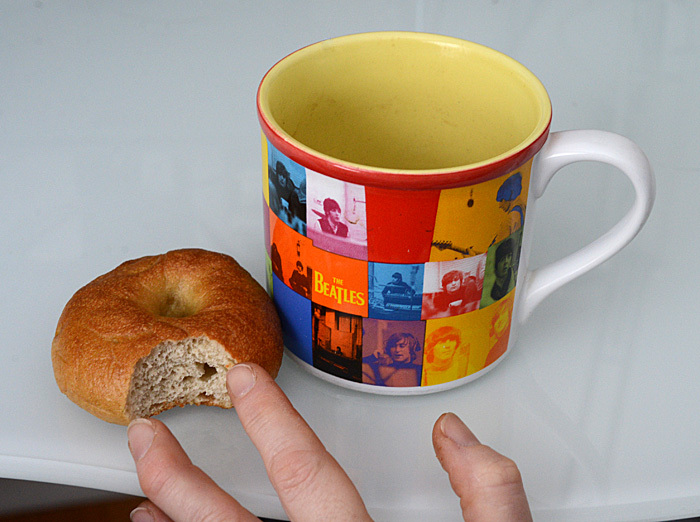 Last night Judy started a new set of bagels and again we are feasting on fabulous bagels. I will no longer be able to buy store stocked bagels again. Not difficult, but does require patience. 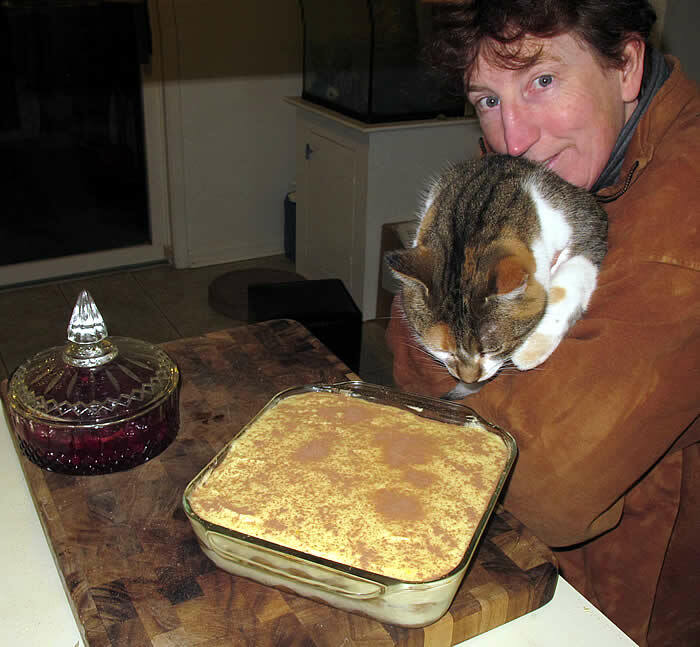 Our traditional Christmas Desserts – Tiramisu (see recipe from last Christmas season) and Cheesecake.